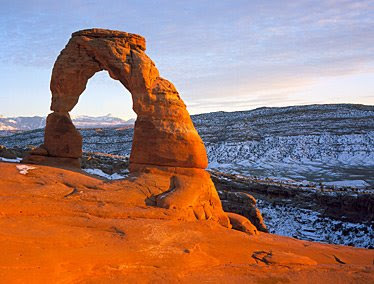 Again, not slighting easily accessed locations, Arches makes a spot near the top of the list as one of the world's geological wonders. A collection of rare self-supporting sandstone arches unrivalled anywhere on earth, as well as many other impressive and mighty sandstone formations make Arches a must-visit venue. Nearby Moab offers lots of other high-tech and new-age yuppie enticements, but for the true boot-leather on the ground enthusiast, best stay away from there except perhaps for food or gas. Inside the park boundaries is everything you need to keep you busy for days on end, looking, learning, gawking, and hiking. If arches make you tired, try columns. Tired of columns? Try natural windows. Through with those? How about climbing sand dunes? Next, try mesas for a change of pace. Then, when you get tuckered out on climbing to the top of mesas, look for different geological strata represented in the sandstone layers. See how many eras you can find represented within different formations. Then ask about creatures and fauna that lived during those periods, and see if you can guess where you might locate fossils within the area. I remember hiking here in 1991.